The earliest known discussion of the calendar date of Jesus’ birth comes from Clement of Alexandria (Stromata 1:21), who writes: “From the birth of Christ, therefore, to the death of Commodus are, in all, a hundred and ninety-four years, one month, thirteen days.” Using the Roman calendar, this works out to November 18, 3 BC. But this is a highly doubtful conclusion, affirmed by no other ancient source. More likely, Clement was using the Egyptian calendar, which did not make provisions for leap years. By that calendar, counting backwards from emperor Commodus’ death on December 31, AD 192, an interval of 194 years (each exactly 365 days), one month (thirty days), and thirteen days yields a date of January 6, 2 BC. This works out to Shevat 1, AM 3759 on the Jewish calendar. Clement’s testimony thus harmonizes perfectly with a face-value calculation from Chrysostom’s dating of the annunciation to Zechariah. Before the church as a whole fixed the date of Christmas as December 25, the generally accepted date in the East (and possibly also in the West) was in fact January 6. Apart from Clement, the earliest sources affirming this date come from the fourth century or later, yet Clement’s testimony proves that the association of Jesus’ birth with January 6 was rooted in much older tradition and may well have been based on historical fact. In the Armenian Orthodox Church, the birth of Jesus is celebrated on January 6 (along with the visit of the Magi and Jesus’ baptism) to this day. And there are those who have determined not only the year of our Lord’s birth, but also the day; and they say that it took place in the twenty-eighth year of Augustus, and in the twenty-fifth day of Pachon. If we reckon Augustus’ reign from the Battle of Actium, September 2, 31 BC, when he put down his last rival, Antony, and if we count the accession year according to Egyptian custom, Augustus’ twenty-eighth year on the Egyptian calendar lasted from August 24, 3 BC to August 24, 2 BC. The 25th day of Pachon in that year was May 20, 2 BC. Yet Clement also says that some remember Christ’s birth on the twenty-fourth or twenty-fifth of Pharmuthi: one month earlier than Pachon 25. The uncertainty as to the correct month leads us to doubt that any of these dates have a factual basis. Furthermore, there is no other documentary evidence that Jesus was born in the period from late April to late May. There seems to be a strong attraction to the twenty-fifth day, but a confusion of the month. Is it possible that the date of Jesus’ birth—or some other important event surrounding his birth—corresponds to the twenty-fifth day in some calendar? Let us first observe that this fixation with the twenty-fifth day seems to have its origins in Egypt. Is there a key date in the early life of Jesus that corresponds to the 25th day of an Egyptian month? There is. April 15, 3 BC likely fell during the week of the Annunciation to Mary, if not on the precise day. This date works out to Pharmuthi 25 on the Egyptian calendar. But there is more. April 7, AD 30 is commonly accepted as the date of Jesus’ crucifixion. Since there were no leap days in the Egyptian calendar, this date also works out to Pharmuthi 25 and perhaps lends support to the ancient theory that Jesus died on the anniversary of his conception and that the incarnation thus lasted for an integer number of years. It is possible that in some locales the celebration of the incarnation originally took precedence over the celebration of the date of Jesus’ birth as such, and Clement’s testimony may be early evidence for an Egyptian celebration of the incarnation that only later became associated with the birth of Christ. But how can we account for the association of the twenty-fifth with Jesus’ birth, and with the winter season? Amazingly, one possible answer is that the visit of the Magi took place on December 25, 2 BC. On that date, Jupiter stopped in its path and began its yearly retrogression through the heavens. Remember: It was Jupiter that, in the previous year, highlighted the star Regulus by in effect tracing a crown above it, likely alerting the Magi to the birth of the King. According to Matthew 2, when the Magi left Herod, the star they were following “stood still” over the place where Jesus was to be found (Mt 2:9). Astronomical calculations reveal that in the predawn hours of December 25, 2 BC, Jupiter indeed stood still in the sky. Observed from Jerusalem, it did this at 68 degrees above the southern horizon, directly over the city of Bethlehem. Although firm conclusions are unwarranted due to conflicting data, early documentary evidence points toward a date of January 6, 2 BC, for the birth of Christ. First, Clement of Alexandria’s testimony in Stromata points to this date if he was using the Egyptian calendar rather than the Roman. Second, the tradition remembered by John Chrysostom that the angel appeared to Zechariah on the Day of Atonement (which fell on Oct 1 in 4 BC), results in a date for Jesus’ birth in the first or second week of January. The first recorded celebration of Christmas on December 25 comes from the Philocalian Calendar of AD 336, although there are some questionable references to a Roman celebration on December 25 in the second century. (Telesphorus [d. ca. 137] is said to have introduced the Christmas midnight mass on this date, but this is contested.) No one in the early church advocated a date in line with the Jewish fall festivals. 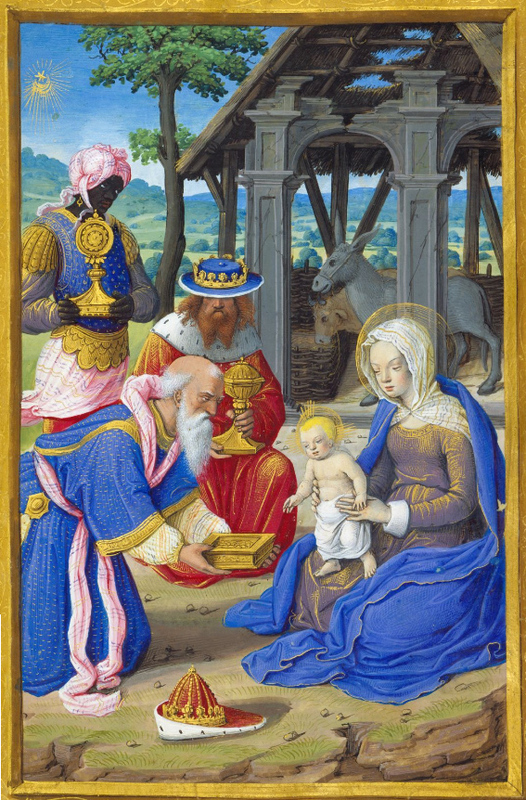 So we have tentatively established the birth of Jesus on January 6 and the visit of the Magi on December 25. Church tradition has reversed these two dates, and it is not difficult to understand why. Although historically accurate, it makes little sense to commemorate the visit of the Magi two weeks before the commemoration of Jesus’ birth. Perhaps influenced by the Egyptian tradition that Jesus was conceived on Pharmuthi 25, the feast of the Nativity was moved to December 25, with the feast of the Epiphany shifted forward to January 6 to retain both traditional dates and preserve a logical sequence in their celebration. By Darrell Pursiful in +Apostles' Teaching, Bible, Christmas, New Testament on December 19, 2006 . Darrell, how much of this is original research? This is really good stuff. Thanks, Anne. A lot of the basic groundwork is laid out by Ernest Martin (linked on the Star of Bethlehem post). That plus some fiddling around with an online calendrical calculator gave me most of what you’re reading. Your arguments on Jesus’ birth are fairly good. I find less compelling the idea of the Magi’s visit in the same year. Herod’s slaughter of the innocents (if historical–and it certainly fits his character!) and the conversations the Magi have about when they see the star and how long they have been traveling, seem to indicate that they arrived 2 years after Jesus’ birth. Of course, there is no guarantee that Matthew has this right (or even that the visit of the Magi is historical instead of a symbol of Gentile recognition when Jews didn’t), but the slaughter of the innocents and the refugee flight to Egypt are historically compelling. If they are historical, then they would need a motive and there is no rival motive to the visit of the Magi. So, I’m inclined to accept it as historical (even though it causes problems when compared to Luke’s chronology which has the Holy Family return to Nazareth 8 days after Jesus’ birth). But I cannot see any compelling case from the biblical witness for dating that visit in the same year–and much against it. I enjoyed your post! Can you tell me some more details about the calculations involved in the Clement of Alexandria quote or some sources that discuss this in more detail? Thanks in advance for any help. I have read some other writers who think the Sept 11 timeframe is correct for the birth of Jesus. I don’t know if this works based on anything that you have discovered. They site the death of Herod as also a way to calculate the date. Herod was suppose to have died before the Passover in 2 BC. and only months after ordering the slaughter of the children. The months is suppose to be found from Josephus writings. I have also read that the description of the woman in Revelations giving birth identifies the astrological signs that existed on Sept 11, 3 BC. I am not sure about this because I haven’t accessed any astrological calculators. I am not sure that I would know what to enter even if I did find one. This is a thought provoking subject and I have enjoyed the information that you use. Thanks. Thanks, JR. I think I’ve made it clear I’m not betting the farm on any of these dates, although the case for 6 Jan 2 BC is rather compelling in my opinion.